“Krugozor” is the universal device that makes it easier to maneuver in the thick city traffic and on the highway. “Krugozor” is the universal system of improvement of the view forward while overtaking and getting into the proper lane for the cars with the driving on the left and on the right. The purpose of the system is to give the driver of the car full information concerning the situation on the road forward on the right while taking the bypass and getting into the proper lane when the traffic is thick (for the drivers with the left drive wheel). It gives also information about the traffic on the median strip forward on the left before the driver fulfills the overtaking procedure (for the drivers with the right drive wheel). The “Krugozor” system is based on the periscope effect of the respective location of two mirrors. The dimensions of it are rather small. The system is installed inside the car above the dash board in the right corner (for the drivers with the left drive wheel) or in the left corner (for the drivers with the right drive wheel). 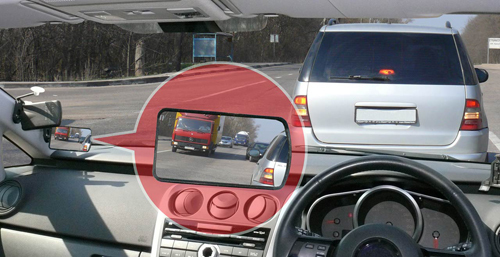 The operability and the usefulness of the “Krugozor” system can be compared with the side mirrors of the rear view. Their presence in the car is nowadays out of question. Every maneuver of getting into the right line without side mirrors is extremely risky. You can easily come into collision. It’s evident. The modern car without the side mirrors can hardly be imagined. But today sometimes we can see very old cars of domestic manufacture without side mirrors of the right view. In the traffic stream they can be seen easily. While getting into the right lane they are immobilized and they often create emergency conditions. The drivers of these cars have already got accustomed to drive the car without the side mirror. But nevertheless while conducting maneuvers of such kind they shock the other drivers and sometimes create emergency conditions. For left-wheel cars: the “Krugozor” system will be useful in the thick city traffic in the multilane streets. The driver will get information about the traffic forward on the neighbour right lane. Thereby the driver can estimate the situation and get into the right lane in proper time, if the left lane, that had been occupied by the driver previously, reduced for some reason the traffic speed relative to other lanes. There is a crossing forward without any control, or a U-turn. And then one of the next cars is going to turn to the left and is waiting for the opportunity to execute a maneuver. The left lane has naturally to reduce the speed, gradually getting into the right lane, preparing to take the bypass. And here the right lanes move as a rule quicker than the left lane. Because of the truck that complicates the vision substantially the situation is ambiguous. Is it time to wait or to get into the proper lane? Now the driver can see that the cars moving before him are taking the bypass getting to the lane more to the right. But if on the right lane forward the roadworks are being carried out, and there is a narrow spot and a bypass there? In this situation getting into the proper lane has no sense. It is the “Krugozor” system that makes it possible for a driver to see and estimate properly this situation. In this case you must wait for the end of the maneuver (turning to the left) and then go on moving on the left lane. A similar situation appears when a car with the hazard lamp in the position “on” is before the truck. Is it time to wait or to get into the proper lane? What is there on the right side? Is the right lane free for the moving traffic or it is occupied by the second participant of the traffic accident, blocking completely the right lane and hindering the bypass? 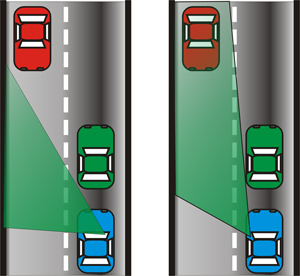 Every maneuver of getting into the right lane is an additional risk of an accident: the right side has a so called blind spot, when a car a little behind moving on the right lane is not to be seen in the mirrors of the rear view (the criminals often use it creating “accidents” on the roads). And in the thick city traffic stream the risk of such accidents is increasing considerably. The “Krugozor” system makes it possible to avoid groundless getting into the right lane. And that means significant reducing of the risk of involving in possible accidents. For the right wheel cars: the driver of the right wheel car equally with the driver of the left wheel car will get in advance all the current necessary information concerning the situation on the road on the left side forward. Thereby without getting in a median strip the driver can estimate, whether the level of safety of the oncoming overtaking is sufficient. As a result the risk of head-on collisions with oncoming vehicles will be reduced. As a result the risk of head-on collisions with oncoming vehicles will be reduced. Without a periscope system the driver of a right wheel car must extensively turn to the left, often unreasonably driving out to the median strip creating emergency conditions. This is due to the fact that the driver sits on the right seat and the traffic moving a little bit forward on the same lane complicates the most part of the vision of the median strip. On narrow two-lane highways while overtaking a truck that substantially complicates the vision the right wheel cars get quite often into the oncoming traffic lane practically under the wheels of the cars moving on this lane. As a result we face emergency conditions and the risk of the head-on collision. The easy in application periscope system “Krugozor” is meant especially for the prevention of such problems. After all the system “Krugozor” helps to adapt the right wheel car to the conditions of the right-side road traffic. Being well informed about the situation on the road forward all around, the driver scores an evident advantage. And the most important thing is that the driver is more in safety! The driver’s viewing angle while overtaking from the left or bypass from the right is increased. The information is shown about the moving forward on the neighbour lanes. All the time and in any lighting there is a distinct reflection like in the side mirrors of the rear view. The system is installed inside the cabin. And it means that the mirrors of the device don’t get dirty. 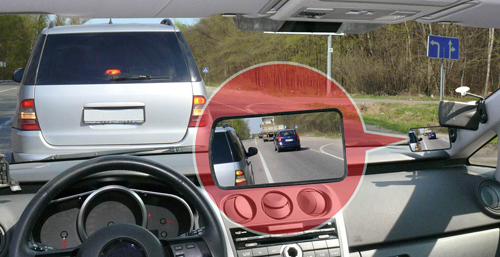 The design of the system and the location of the mirrors are calculated in such a way that the windscreen wipers of the car clear vision zones, don’t shut the driver’s vision and don’t disturb the passenger. 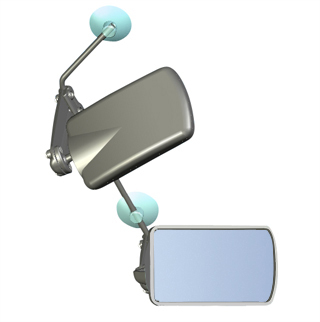 The main mirror of the device is located at the same level as the side left mirror of the rear view is. Thus one head rotation is enough to get information from the both mirrors. Therefore there are minimum things to distract your attention! The installation and adjustment of the device takes minimum of the time (one or two minutes), and can be performed without assistance and without any tools. The system is installed by means of high-powered (massive) suction caps. The device is universal. It is sutable both for the left and right-weel cars. It will do for the cars of any kind of the body and angle of inclination of the windscreen: automobiles, minivans, trucks. Wholesalers and retail stores are welcome!The profitability and being in continuous much demand is ensured by the well considered pricing policy and high consume properties of the device. Being the producer we ensure the advertising support in all mass media. The articles and surveys dedicated to “Krugozor” have been published and will continuously be published in the leading periodicals about the automobile industry. While implementing the device “Krugozor” you contribute in reality to the safety of the moving traffic, because additional information about the traffic situation couldn’t be unnecessary. To start the cooperation and to get the price-list, please email us your request. Our e-mail address is as follows: info@pravorul.ru. Or tel. us: +7 985 424-94-33. In your request inform us necessarily about your company, send the addresses of the stores, scheduled scope of sales.